A young woman, Nyan, travels from chaotic city streets to a rural village where she attends the funeral of her estranged father. Distant and seemingly unaffected, she eschews affection from his widow. Following the ceremony she finds herself drawn inexplicably into the forest. Nyan journeys through lush jungle, where a supernatural encounter occurs. Shot on location in Ghana, Kwaku Ananse is visually saturated and lush. Weaving together myth and autobiography, this short film is deeply affective and personal; a dedication to the young filmmaker's late father. More narratively driven than much of her previous work, it nonetheless demonstrates consistency with her oeuvre. Owusu's knack for formal experimentation animates the film. Rhythmic and pulsating, brought to life through visual contrast and music, Kwaku Ananse finds vitality in death. Obenson, Tambay. 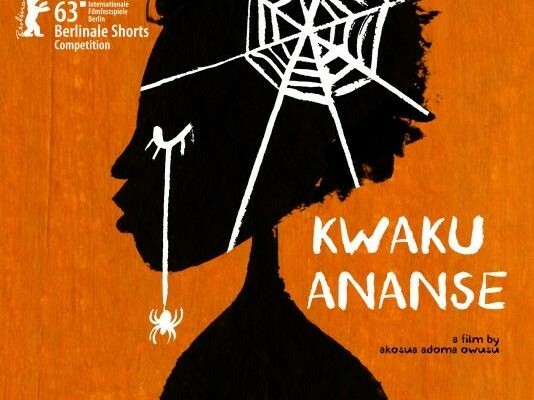 "'Kwaku Ananse' - A Fable, A Funeral And A Spider Coffin (Fundraising)." IndieWire, 1 Aug. 2012, http://www.indiewire.com/2012/08/kwaku-ananse-a-fable-a-funeral-and-a-spider-coffin-fundraising-143463/. Sekyiamah, Nana Darkoa. "Akosua Adoma Owusu: From 'Kwaku Ananse' to 'Bus Nut.'" This is Africa, 21 April 2015, https://thisisafrica.me/lifestyle/akosua-adoma-owusu-kwaku-ananse-bus-nut/ .